I know, I know…Frequency Separation is a VERY hot & loaded topic to bring up, and no, you don’t _have_ to use it. It’s pretty easy to go way too heavy handed with F.S. and end up making your portrait client look like a plastic doll. But when it’s used right, it’s pretty much going to be your go-to tool for perfecting your clients’ images. A lot of professional full-time retouchers, love it or hate it, use Frequency Separation on nearly everything, so let’s ignore the arguments about what can go wrong with F.S. and just go into why this panel is actually pretty amazing. Installation is easy, just unzip and run the installer, (Pc or Mac), and then start up Photoshop. You may have to enable the extension to show up in your toolbars. 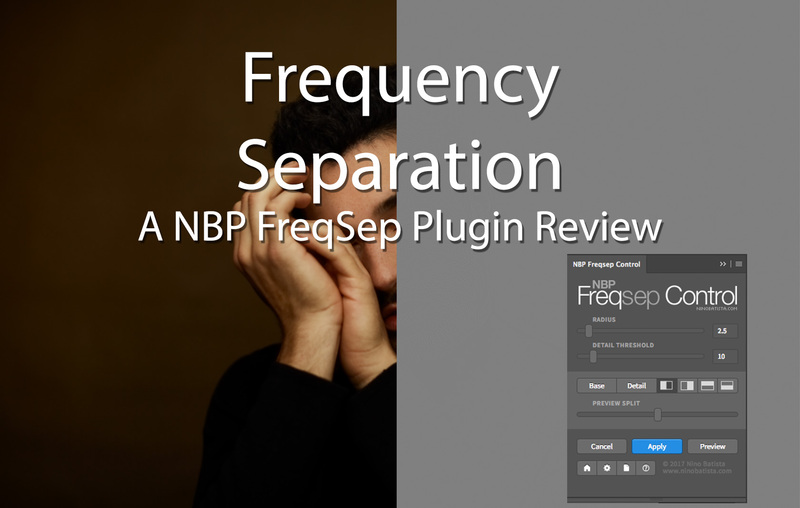 You’ll find the NBP FreqSep Control under the Window -> Extensions -> NBP FreqSep Control, just click it and it’s live in your tools. Now, for those of you already familiar with Frequency Separation and how it works, this panel lets you do exactly what you expect. What makes it different from the rest of the F.S. systems out there is it gives you a preview of your settings, (and does so very quickly) before you click the apply button. This alone makes it worth the price of admission in my humble opinion, but what sold me above and beyond was how there were no luminosity changes when you run the action! A lot of other Frequency Separation actions will end up slightly darkening your image. For a lot of us, that’s not a huge deal, but in the commercial world, it can be a dealbreaker. Your clients will notice that shift and it can be a massive headache to bring that brightness back. Being able to apply these adjustments with no luminosity change is all kinds of awesome for everyone involved. So let’s have a look at the panel in action with a live preview. The panel with either the live preview enabled or manually selected gives you complete control over the intensity of the action before you run it, saving you a lot of time in the long run since you won’t have to run/delete and re-run again of you went a little heavy. We all know that anything that’ll save you time in the retouching world is gold! You’ll notice that no matter what you’ve set the sliders too, once the actions have run, you’ll see no difference to your image’s luminosity when you enable or disable the group! Now, for me, not being a professional retoucher, I tend to stay away from the High and Low layers in this group. Those are the sections where if you don’t know what you’re doing it’s easy to go overboard. Where I spend my time is actually in the Transitions section, which is the empty layer in between the High and Low layers, where you can use the brush and eyedropper tool to match your skin tones to remove any inconsistent, shadowed, or blotchy areas without any fear of ruining or over-smoothing out the texture of the skin. For the organization-obsessed out there, you can add as many layers as you like labeling them for each section you work on to keep it organized for later re-edits. Since it was just hands and face in this image, I made two Transition layers and then started selecting the primary skin tones to blend and paint them in to look more natural. Given I’m no pro retoucher and not the best with skin retouching, this simple in-between layer for matching tones has been a lifesaver for me. The Transitions layers do the majority of the hard work in a fraction of the time I used to spend on it! So yes, I’ve changed my stance on Frequency Separation thanks to this plugin and it’s now become a regular part of my workflow. View results of Low and High-frequency layers according to the settings in real time. Adjust settings on-the-fly to your preference or to the ideal parameters for your files. Faster, smoother, and higher quality than Photoshop’s surface blur and gaussian blur traditionally used in frequency separation. Actively adjust both parameters simultaneously to tailor the exact type of frequency separation you need and want. Dial up more smoothing (blur) for your Low-frequency layer while previewing in detail to avoid over haloing near high contrast transitions. More texture is preserved than in traditional frequency separation. Affords you the freedom to more intensely add color under texture to smooth out transitions without sacrificing it as much. The algorithms are implemented to take advantage of modern CPUs for a real-time experience. Works with 8, 16 and 32-bit images. The plugin was created by Nino Batista and his team and for more information, you can visit his site ninobatista.com/plugins or here for more direct tutorials.